VIPRE Internet Security is the award-winning internet security suite that includes a firewall, a spam filter and bad website blocking into one powerful solution for complete protection against malware. It is focused on speed, protection and simplicity and so it lacks some additional features like backup, parental control etc. Like Bitdefender, there is also VIPRE Internet Security Lifetime Edition that includes all the features available in current version of VIPRE Internet Security but with the added advantage of lifetime protection and antivirus definition updates. Consumers will pay only the one-off retail price for the product and will receive virus definition and software updates for the life of the PC on which it is first installed. Current version of VIPRE Internet Security Lifetime Edition has the following features. VIPRE® Easy Update™: Updates the most common cause of PC infections and attacks – out-of-date software – automatically. Two-way firewall: Protects against incoming and outgoing Internet traffic quickly and easily with customizable settings for advanced users. High-performance anti-malware engine: Combines advanced antivirus and anti-spyware technologies to provide complete security that doesn’t slow down your PC. Secure File Eraser: Adds an “Erase Files” option to your Window’s Explorer menu to permanently delete all traces of a file. PC Explorer: Reveals settings on your computer that are normally hidden and enables you to add programs to the Always Allowed list. You can download a 30 days full featured trial of VIPRE Antivirus Lifetime Edition using this link. 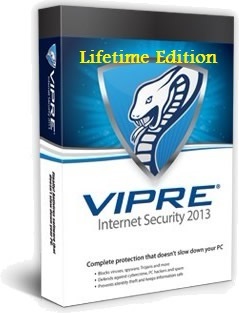 1 PC license of VIPRE Internet Security Lifetime Edition costs $99.99 and can be purchased using this link. 20% Discount – Use Coupon Code: 2013-PC-Lifetime or Use This Link to purchase.